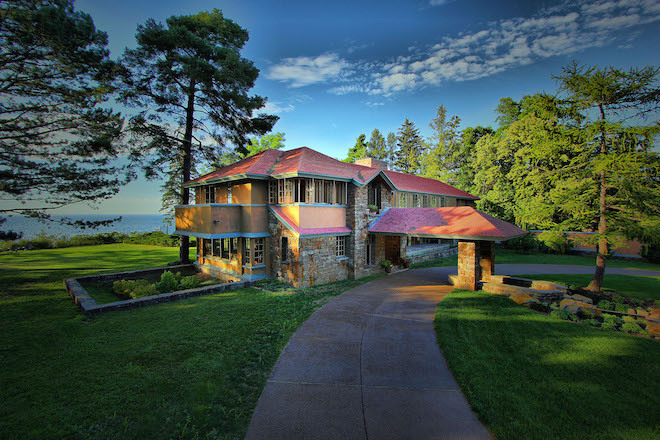 While the design of Graycliff may have been a departure for Wright, the assignment found him collaborating with a longtime client. Darwin D. Martin, a key executive at the Larkin Soap Company in Buffalo, had already commissioned Wright to design his opulent family home as well as the Larkin Building, a celebrated example of commercial design. When Wright agreed to create a summer retreat for the Martin family on eight acres southwest of Buffalo, the job offered the architect a chance to reunite with one of his most loyal patrons during a period of personal and financial difficulties. Graycliff boasts an artful exterior of stucco and limestone (pyrite in the limestone gives the building its rusted look). Sitting 21 miles away from the Martin Complex, it’s also separated by both distance and design philosophy. Wright was moving past the Prairie style and utilized many features and materials specific to the lakeside location: limestone from the beach was used throughout the home, most notably in a large central fireplace, and copper window screens reflected more of the setting sun into the home. The driveway is angled, pointing towards lake instead of the front door, and an irregular pool in the front connected the structures to the water. But the most important element was light. Martin’s wife, Isabelle, suffered from severely limited vision, so he asked the architect to design with her wishes and needs in mind and focus on openness and illumination. Isabelle wasn’t afraid to make her demands known, at one point writing, “with all the realm of architectural design at your command your unparalleled genius surely will not balk at this small problem.” A great example can be found in the sprawling landscaping. Wright set about sketching a master plan for the grounds, playing with form and spatial relationships and adding an irregular-shaped pond to the center of the front yard. But it didn’t include enough of the fragrant, colorful flowers that Isabelle requested, so the Martin’s eventually hired Ellen Biddle Shipman, the dean of women’s landscape architects, according to House & Garden to update Wright’s plan. The restored grounds that visitors see today are so significant, according to Hauser, because they benefitted from a pair of great design talents. Other touches, such as a cantilever in the center bridge of the house, the large transparent glasses facing the lake, or panels of glass coming together at the corners of the home, separated by a metal rod, are thought to prefigure some of the techniques used at Fallingwater. The finished compound, three buildings spread across 2.5 acres, including a servant’s quarter, the 6,500-square-foot main residence and boiler house, form an L-shape around a circular drive. The family summered at the home for years, but after Darwin and Isabelle passed away (1935 and 1943), their children decided to sell in 1945. The buyers, an order of Hungarian priests called the Order of the Pious Schools, or Piarist Fathers, turned out to be poor caretakers. Starting in the mid-’50s, the priests began to add to the property, constructing a school house, chapel and additional living spaces that concealed Wright’s designs. The additions meant the home fell largely out of the conversation; even a plea by Wright himself, who visited the home in 1958 shortly before his death and offered to design a chapel for the priests, didn’t change their approach to overseeing (and obscuring) the property. A few decades later, after its ranks had dwindled, the Catholic order decided to sell. 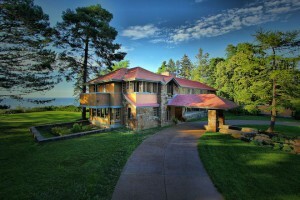 The landscape and general look of Graycliff was a bit rough—between additions and overgrowth, you “literally couldn’t see the Wright architecture,” according to Hauser—and most potential buyers, originally entranced by the famous name, were scared away by the amount of money restoration would require. A developer began circling, submitting a bid and making an offer to buy the property, with the idea of demolishing the now overgrown and enveloped masterpiece and building condos on the prime lakefront property. Luckily for preservationists, a group of locals, disenchanted by the neglect that had nearly destroyed the home, banded together to form the Graycliff Conservancy in 1997. Without deep pockets of substantial support from foundations, they raised $450,000 to secure the home, then embarked on a long-term renovation program. In the early days of the group’s efforts, according to Hauser, a handful of remaining priests still lived inside, occasionally waving to the curious as they explored the property during tours. Things have come a long way in the proceeding years. After removing the non-Wright structures, repairing the exterior, balconies and terraces, as well as restoring the landscape, the group is now focusing on the interiors. Within the year, they expect to begin repairs on the living room, dining room, breakfast nook, Fern room and Darwin Martin’s master suite. They’ve already replaced the damaged flooring with original 1940’s wide-plank Cypress. Additional landscaping and the restoration of a Frank Lloyd Wright-designed tennis court are the only big projects left on the list.